While this doesn't fully assert the issue, it shows that the primary key can grow tremendously without actually writing new rows. Each time create_or_find_by hits ActiveRecord::RecordNotUnique, it rolls back, but the auto-increment does not. The fact that auto-increment does not roll back seems to be expected behavior from PostgreSQL. Still, the fact that this happens with create_or_find_by led to one of our database tables running out of primary keys in production, preventing the creation of any new rows. I'm unsure what we can really do about this. Just for completeness, is this also a problem with the old find_or_create_by with a rescue ActiveRecord::RecordNotUnique? Yes, this will happen in the case of the data race of find_or_create_by, and in general any time a create fails at the database level. But given that it's a data race issue in find_or_create_by, the majority of uses cases are likely to be a successful find or create, leaving the failed create and incrementing primary key issue with a much smaller footprint. My concern with create_or_find_by is that the growing primary key issue is brought front and center because failing at the database level is promoted. In the best case, create succeeds more often than not, and a growing primary key is not much of an issue. In the worst case, create fails often because the item already exists, leading to the issue we had. I can already see that create_or_find_by may be seen as a possible jump in performance over find_or_create_by for some people, and it may be adopted without thought or knowledge of consequences of this issue that they may hit. All in all, I feel that create_or_find_by has a dangerous side effect that can lead to large production issues. I think it might be worth considering removing the method or replacing it with a safer method (I don't know what that might be). For instance, is there much more gain from create_or_find_by than doing the retry logic that was documented before? Could that become its own method that users don't have to re-create in their applications? All in all, I feel that create_or_find_by has a dangerous side effect that can lead to large production issues. But only on Postgres, correct? Or did SQLite and MySQL auto-increment the primary key without rolling back too? At the very least we should mention this in the documentation. I'm not entirely sure an outright removal is the right course of action. This seems somewhat par for the course when we're talking uniqueness and Postgres. E.g. this could happen with a failed uniqueness validation that's retried as you said, create_or_find_by just exacerbates the issue. How did you work around this in your app? Was it enough to go back to find_or_create_by + rescue? @dhh what's your take on this? As I understand it, create_or_find_by has been a fine extraction for Basecamp 3. It's certainly good to point out this gotcha in the documentation, at the very least. We use MySQL at Basecamp and are happy users of this method in production. @alexcameron89 I take it your column isn't a big int? I take it your column isn't a big int? That's a good callout, the table that was affected had int as primary key. In reality, this is likely to only affect int tables. But given that bigint didn't become a default until 5.0+, there's a high likelihood that this method will be used on many tables with int primary keys, and that's a little concerning. Or did SQLite and MySQL auto-increment the primary key without rolling back too? At the very least we should mention this in the documentation. It looks like Mysql is affected by it (script), but SQLite is not (script). It's certainly good to point out this gotcha in the documentation, at the very least. I'll push up a PR with a callout in the documentation. Whatever PR for doc changes should recognize that you're only to be alarmed if you're using int for your pks. And if you are, you should be concerned whether you run this method or not! We ran out of ints a while back at Basecamp. Not a fun time. So you carrying a time bomb in your app if you keep pks as ints. On Mon, Mar 11, 2019 at 2:01 PM Alex Kitchens ***@***. ***> wrote: *Column Type: Int* I take it your column isn't a big int? That's a good callout, the table that was affected had int as primary key. In reality, this is likely to only affect int tables. But given that bigint didn't become a default until 5.0+, there's a high likelihood that this method will be used on many tables with int primary keys, and that's a little concerning. *Other affected DB's* Or did SQLite and MySQL auto-increment the primary key without rolling back too? At the very least we should mention this in the documentation. It looks like Mysql is affected by it (script <https://gist.github.com/401fd48d0f21fcf7262c4d20422efee5>), but SQLite is not (script <https://gist.github.com/alexcameron89/4da7d4be2a8380a74f9d0708cc66d275>). *Documentation* It's certainly good to point out this gotcha in the documentation, at the very least. I'll push up a PR with a callout in the documentation. *The Future* The only logical explanation is that @alexcameron89 <https://github.com/alexcameron89> is speaking to us from 2.5 billion years in the future! 😄 It's true!bigbigbigint is the new hip thing these days. 😄 🤖 — You are receiving this because you were mentioned. Reply to this email directly, view it on GitHub <#35543 (comment)>, or mute the thread <https://github.com/notifications/unsubscribe-auth/AAAKtWQJjPUPXtFEUR3s6xaKARPGjgbEks5vVsQfgaJpZM4bmQjM> . Perhaps we should deprecate having int for primary keys in Rails 6? Not sure about all the ramifications, but it could be good to something here. Or we could add a task to help generate migrations for it. It's true that int PKs are a timebomb, but this method accelerates the clock significantly. Running out of ints with a table of a few million wasn't expected. The sequence basically becomes a query count. I've come around to the idea that find_or_create_or_find_by is a better behavior in our case (though I'd never suggest rails having that method). I'm dubious of the general-purpose utility of create_or_find_by after having experienced that outage. There are already 4 bullet point drawbacks listed in the documentation for this method, this would be a 5th. Better to warn people than have them discover it "naturally" as we did. On Mar 11, 2019, at 18:13, Bradley Schaefer ***@***. ***> wrote: We experienced an outage from create_or_find_by with a table on the order of a few million rows - big, but not growing at a rate that we'd have expected to exhaust the sequence. We had assumed the sequence roughly corresponded to the table size. Even then migrating from an int column to a bigint took a fair amount of downtime. Is anybody monitoring their database sequences? (I doubt it) It's true that int PKs are a timebomb, but this method accelerates the clock significantly. Running out of ints with a table of a few million wasn't expected. The sequence basically becomes a query count. I've come around to the idea that find_or_create_or_find_by is a better behavior in our case (though I'd never suggest rails having that method). I'm dubious of the general-purpose utility of create_or_find_by after having experienced that outage. There are already 4 bullet point drawbacks listed in the documentation for this method, this would be a 5th. Better to warn people than have them discover it "naturally" as we did. — You are receiving this because you were mentioned. Reply to this email directly, view it on GitHub, or mute the thread. The race condition it was designed for IS a problem for me, but find_or_create_or_find is a less-surprising solution. The race condition was a low-grade annoyance in our application's BugSnag, and so we applied create_or_find_by thinking it's no big deal. Months later we had an outage over an hour long because of this decision. It's true it doesn't matter as much with bigint columns. Migrating to bigint columns can take a fair amount of work depending on your system - we took out service offline to isolate the database and ran the migration and it took about 45 minutes against a few million rows - it's rewriting the table and indexes which is expensive the naive way. Zero downtime migrations take a bit of prep that you may not be prepared for if you're thinking you're not going to run out of ids because your table is a few orders of magnitude smaller than the limit. I'm happy it works for you in Basecamp. The people that will hit this are likely to be those upgrading pre-existing apps that have not converted everything to bigints. Yeah. Hitting the int ceiling is nasty. Sorry that happened to you. We should definitely document that using this method can hasten that, and suggest that people only use it once they’re on bigint. On board with that part. On Mar 11, 2019, at 19:52, Bradley Schaefer ***@***. ***> wrote: The race condition it was designed for IS a problem for me, but find_or_create_or_find is a less-surprising solution. The race condition was a low-grade annoyance in our application's BugSnag, and so we applied create_or_find_by thinking it's no big deal. Months later we had an outage over an hour long because of this decision. It's true it doesn't matter as much with bigint columns. Migrating to bigint columns can take a fair amount of work depending on your system - we took out service offline to isolate the database and ran the migration and it took about 45 minutes against a few million rows - it's rewriting the table and indexes which is expensive the naive way. Zero downtime migrations take a bit of prep that you may not be prepared for if you're thinking you're not going to run out of ids because your table is a few orders of magnitude smaller than the limit. I'm happy it works for you in Basecamp. The people that will hit this are likely to be those upgrading pre-existing apps that have not converted everything to bigints. — You are receiving this because you were mentioned. Reply to this email directly, view it on GitHub, or mute the thread. I'd like to consider making that the behaviour of find_or_create_by, if you're interested in PRing it. To me the ideal would be that they both have similar[ly rare] failure scenarios, and the choice of find_or_create_by vs create_or_find_by would boil down to whether you, on average, expect the row to exist.. and thus which one is more likely to save you a query. growing primary key issue with `create_or_find_by`. Was looking at this, in terms of PostgreSQL, there isn't an obvious way to change anything. Figure I should post the experiment in case any others find value in it. Takes seconds on a table with 1M records. I'm surprised by the unwillingness to recognize the problem that this issue is attempting to address. While bigint columns certainly pushes the ultimate breaking problem down the road (billions of years, even), it doesn't make the actual problem go away (unnecessary skipping of unused primary key values). You think it's a problem that too many straws are being opened and discarded unnecessarily before being used, and you're upset that the lake behind your house is getting filled with straws? I'm sorry you're experiencing this, but the lake behind my house got filled a long time ago, so I understand how you feel! Just start discarding your unused straws into the ocean, it's much bigger than your lake and you won't notice they're there until you're LONG gone! 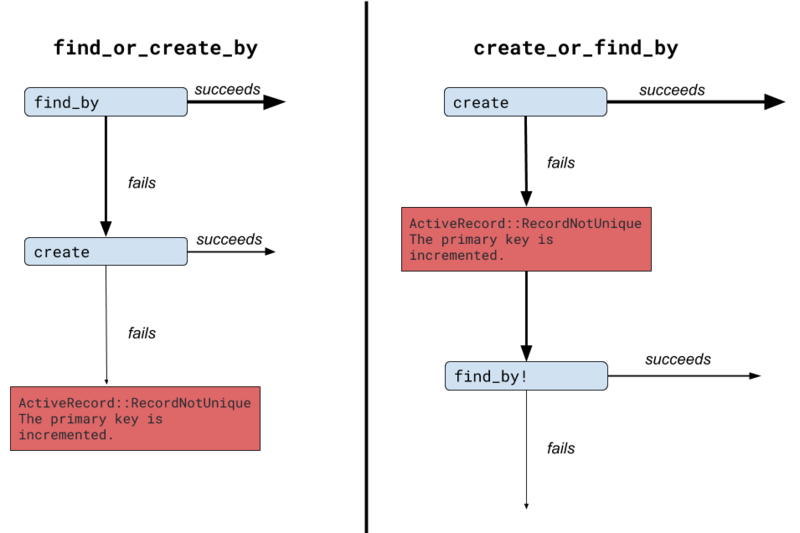 While I'm probably more OCD than most about missing chunks of primary keys in my tables, I think a quick education in the docs around the scenarios in which create_or_find_by should be used instead of find_or_create_by would be appropriate, given the potential drawbacks. Rails is awesome for its accessibility to newer developers, and I would be concerned about create_or_find_by being accidentally misused when find_or_create_by would be more appropriate (especially if it were updated to behave like find_or_create_or_find_by, as has been suggested). On Tue, Mar 12, 2019 at 12:19 PM Tyler Johnson ***@***. ***> wrote: I'm surprised by the unwillingness to recognize the problem that this issue is attempting to address. While bigint columns certainly pushes the ultimate breaking problem down the road (billions of years, even), it doesn't make the actual problem go away (unnecessary skipping of unused primary key values). In my opinion, it'd be similar to saying: You think it's a problem that too many straws are being opened and discarded unnecessarily before being used, and you're upset that the lake behind your house is getting filled with straws? I'm sorry you're experiencing this, but the lake behind my house got filled a long time ago, so I understand how you feel! Just start discarding your unused straws into the ocean, it's much bigger than your lake and you won't notice they're there until you're LONG gone! — You are receiving this because you were mentioned. Reply to this email directly, view it on GitHub <#35543 (comment)>, or mute the thread <https://github.com/notifications/unsubscribe-auth/AAAKtfsj10zSTLKKGZgREYR2ocJbGNTcks5vV9OggaJpZM4bmQjM> . But if you're on bigint, then it won't matter, unless you for some bizarre reason considers incrementing a counter the same as littering. I do consider it unnecessary litter in my db. Maybe I'm the anomaly, and if so, I apologize for the inaccurate comparison. And if that's the case, you are, as in all other cases, utterly free not to use this feature. In the case I'm not the anomaly, my concern isn't that I would use the feature inappropriately, but that countless others might; and that they'd eventually be upset at their unintentional littering of their own db. @matthewd I'm working on this and trying to find a good way to test it. Since the mitigation to this issue was decided to be documenting the issue, and since that was merged in #35573, I'll close this issue. Add a note explaining when the has_many associations callbacks will be called or not. * After rails#35281  and rails#35036 AV warns about not having the compiled container. This adds a few additional tests to the commits by eileencodes (rails#35497) and rafaelfranca (rails@cfa22f1). The additional tests cover several more ERB tag formatting cases such as multiline tags, conditional statements that result in duplicate keys, and multiple erb statements on a single line. * Update small typo in documentation. The `Row` class is no longer used since d956772. since I was already working on this. Useful to not query for indexes when an application uses schema cache. a module but a class. * Revert "Remove Marshal support from SchemaCache"
build doesn't error when trying to create a file in the tmp directory. adds the secret_key_base so we don't need to generate one. application. This was added in Rails 5.0.0(rails@f06ce4c). used as a mime string. automatically expanded in console and dbconsole commands. same behavior of all the commands. `EnvironmentArgument` also defines the environment option, it is reused. fixed desc to be defined for each command. calls LookupContext::DetailsKey.clear (which clears all caches). this extra logic to compare mtimes and conditionally reload templates. extensions to match on, it will match any extension. views as a helper method, which now conflicts with this new method. this method with an underscore, renaming this method to `_run`. This allows specifying the environment as would any other rails commands. especially in order to use `MAX_EXECUTION_TIME` (refer rails#31129). helpful to turn heavy queries for large scale applications. * Raise UnknownAttributeError when unknown column is passed to insert_all and friends. This is to easier make `truncate_tables` to bulk statements. When building the cookie_jar for the current test request. It was possible for this method to override keys currently being set on the test itself. In situations such as when making two requests mixing creating the cookie on the test and the controller. These are introduced after Rails 6.0.0 beta2. Here is only place where we use `mb_chars` internally. * Revert "Pass HTML responses as plain-text in rails-ujs"
That is completely covered by `Arel::Nodes::ValuesList`. Internal usage for the method as public has removed at rails#29623. work 100% correctly due to caching). Probably that is useful for any other feature as well. because it didn't know what to do with it. This also prevents insert_all from leaking its attributes checks. MIME Type validation regular expression does not allow for MIME types initialized with strings that contain parameters after the MIME type name. each middleware in the stack. instead in the middleware itself. Thor automatically adds `-` if aliases do not start with `-`. But Thor follows a convention of one-dash-one-letter options. So, even if `-` is added to `db`, it does not work. grasp. The documentation only mentioned indexes and partial indexes. when we can just look it up? * [ci skip] Documentation pass for insert_all etc. * Show options as list. test wasn't specifically interested in using `render file:`. correctly used. So `localhost` is used instead of `0.0.0.0`. Specify binding explicitly to avoid being affected by Puma changes. 1. Add SQL comment support to Arel via Arel::Nodes::Comment. 2. Implement a Relation#annotate method on top of that. comment and teachers the relevant visitors how to handle it. through any of the four (Select|Insert|Update|Delete)Manager objects. query annotation via SQL comments. string that will be appeneded to any queries generated by the relation. leverage #instrument for messaging in addition to instrumentation. Was getting `formats=': Invalid formats: "html"
a foreign key (it belongs to the intermediate association). as changed. So it updates every time when the origin record updates. the same behavior as creating a new app. from accidentally causing the Denial-of-Service on their server. Assigning a has_one association for a persisted record saves the change immediately, so attempting to read a rich-text attribute on a persisted record without a corresponding ActionText::RichText would eagerly create one. Avoid assigning the rich text association to fix. status the better suited for this. 1 instead of 0 queries were executed. SHOW FULL FIELDS FROM `topics`. Finished in 6.894609s, 0.5802 runs/s, 1.0153 assertions/s. post, it is wrongly associated with remaining tagging records. template path, and in the same order as they are in the default pattern. which does not work with a custom pattern. RuboCop 0.66.0 has been released. And rubocop-0-66 channel is available in Code Climate. modifier. And this PR applied the auto-correction fixed by it. Hex encoding is base 16 which makes the original input twice as big. With this change less time need to be spent in fixed_length_secure_compare. should not be changed in any other test. current behaviour is surprising to developers. This commit deprecates the existing "lookup a template from anywhere"
detected (and will default to :plain). previously-vulnerable behaviour if it isn't a benefit to developers. .all isn't a valid file extension, so it shouldn't used as a symbol. no-op, so finding by truthy boolean string (i.e. value on boolean attribute is always serialized to TRUE or FALSE. serialized as TRUE is not a desirable behavior for anybody. This allows falsy boolean symbols as false, i.e. `where(value: :false) # => value = FALSE`. receive the fully constructed record. so the array difference in the deleted code is always an empty array.